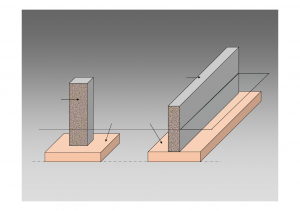 The spread/isolated/pad footing is generally constructed to support an individual column. 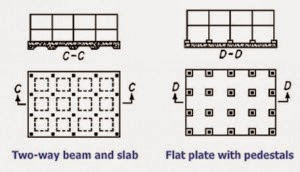 The spread footing may be circular, square or rectangular slab of uniform thickness. Sometimes it may be designed as stepped or haunched to spread/distribute the load over a larger area. The strap (or cantilever) footing comprises of two isolated/individual footing connected with a structural strap or a lever. The strap is featured to connect the two footing in order that they works and becomes like a single unit. However, the strap simply works as a connection beam and does not resist any soil reaction. Thus, the strap is designed as a rigid beam.The individual footings are designed such that their combined line of action passes through the resultant of the total load. The strap footing becomes more economical than a combine footing when the permissible soil pressure is comparatively greater and also the distance between the columns is greater. The mat/raft foundation is a big slab supporting a number of columns and walls its entire structure or in a large part of the structure. 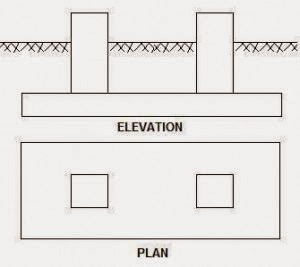 The mat is efficient when the permissible soil pressure smaller or where the columns and walls are very close such that individual footing gets overlap or nearly touched each other.The mat foundations are efficient in eliminating the differential settlement on the non-homogeneous soils or where there is a large variation in loads on the individual columns.